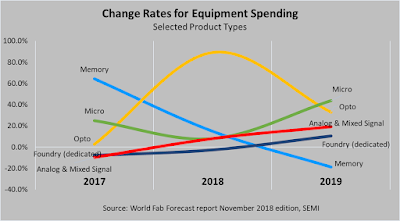 SEMI: Total fab equipment spending in 2019 is projected to drop 8%, a sharp reversal from the previously forecast increase of 7% as fab investment growth has been revised downward for 2018 to 10% from the 14% predicted in August, according to the latest edition of the World Fab Forecast Report. 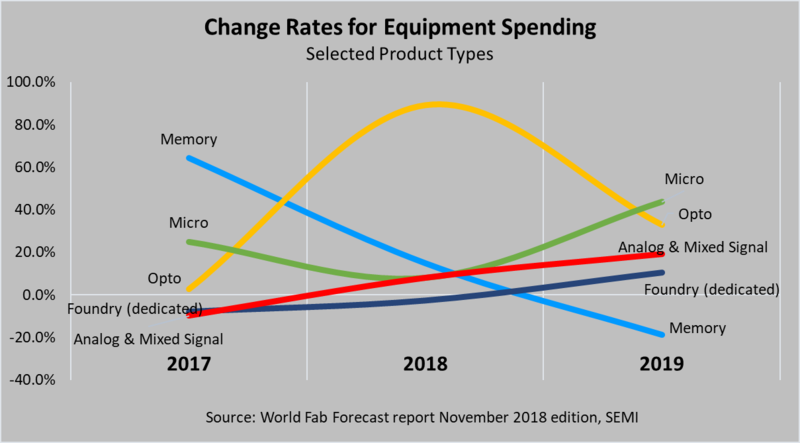 However, image sensor fab spending remains a bright spot: "Opto – especially CMOS image sensors – shows strong growth, surging 33 percent to US$3.8 billion in 2019:"
The yellow line is a growth rate. It's still positive in 2019 and is equal to ~33% in mid-2019.